Unlike the Piano Concertos, which span the composer�s full (though admittedly short) career, the Violin Concertos are the work of the young Mozart, and written in his late teens. In saying that, I am excepting the wonderful Sinfonia Concertante of four or five years later, which is very much a work of his extraordinary maturity, and happily included here. Not included here - but then the set doesn�t pretend to be complete - are the additional movements for violin and orchestra - the suave but spirited 1776 replacement for the finale to the B flat Concerto; the elegant substitute Adagio (also 1776) for the A major Concerto; and the isolated 1781 Rondo in C major, K373. It�s a pity that these interesting pieces - half an hour�s worth? - have been omitted from this project, especially as there�s plenty of room remaining on the discs for them. Never mind! What we�ve got here is undoubtedly major Mozart. Anyone unaware of the treasures hidden in this repertory should not hesitate to investigate! Prodigiously talented youngsters - Mendelssohn and Korngold, perhaps - often come up with beautifully crafted and memorable music, but seldom challenge convention, or have you wondering what on earth lies round the next corner. But Mozart does! Who else would turn the contemporary convention of a soloist�s first statement being a scalic flourish or two (before stating the material we�ve already heard in the orchestra) into a miraculously beautiful Adagio, midway between bustling Allegros, as Mozart does in the opening movement of the A major Concerto? Who else would resist the convention for rumbustious tonics and dominants by way of noisy ending, and instead leave the music delightfully mid-air - just oboes and horns, the soloist and the rest of the orchestra merely watching - as Mozart does in the finale of the G major Concerto? These, and a thousand more delights, await you! 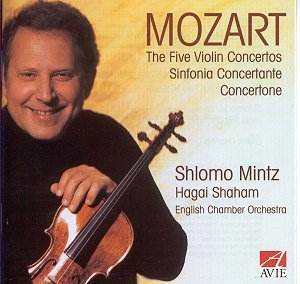 Shlomo Mintz has always impressed me as one of the most completely reliable and rounded artists we have. He has a wide repertory, sounds like velvet, and possesses a phenomenal technique. And he allows music to speak for itself without intervening or imposing his will upon it. Indeed, he seldom if ever disappoints. Given these expectations, I�m sorry to say that this set comes perilously near to being disappointing. There�s much beautiful playing, and there�s a carefree quality which is most engaging. I use the word �carefree� intentionally and advisedly. At best, this music-making reflects the sense of fun and the youthful vigour of its composer, without a care in the world: and this is truly infectious. On the other hand, some articulation, phrasing and textures are less than perfectly finished, suggesting an almost casual (indeed careless) approach which, these days, is surely less than we have a right to expect. Some of the playing - and I include the English Chamber Orchestra in this observation, fine musicians though they are - sounds, dare I say it, routine. Steady tempi don�t always help: the Turkish elements in the A major�s Rondo sound positively polite, and the Rondo of the D major is laid back to the point of sounding tired. One of my pet irritations with string players is that they can, if inattentive to the lie of a phrase, undo the sense of a phrase�s rising and falling by allowing the tone to wax where it should wane, or vice versa. This can happen if the bow�s moving in the wrong direction, or when the player doesn�t try hard enough to limit the natural tendencies of an up-bow to intensify tone (and a down-bow to relax tone) when the shape of the phrase clearly demands the opposite! Interestingly, and unsurprisingly, singers and wind players seldom exhibit this �fault�: their inhaling and exhaling is usually precisely what the phrase warrants! Mintz, it seems to me, sometimes falls into this trap. And, once or twice, he seems more concerned to give the orchestra a clear lead at the beginning of a tutti than to finish his own phrase properly. Some of his articulation is plain odd! The groups of four semiquavers which form part of the G major Concerto�s opening theme are played as detached groups (you can almost hear what would be a quintuplet semiquaver rest at the end of each!) which disrupts the flow of the line. You could say the same for the slurred pairs of notes which form the slow movement theme of the A major: breaking them up as Mintz does is mannered in a self-important way, which I find irritating! And the playful drum-like semiquavers in the G major Concerto�s finale - I�m referring to the second idea - are played �on� the string, and with anything but the spiccato (�off� the string) effect Mozart surely intended, thereby under-characterising this most delicate of musical ideas. I have to say the Sinfonia Concertante fares rather well. There�s much beautiful playing here, with Mintz - as so often with violinists turned temporary violists - Menuhin, Kennedy, Zuckerman - excelling himself. Although the slow movement sounds marvellously dark, and the dialogue of the two soloists is compelling, I wish they could agree more on how exactly to phrase and shape the material they share! Maybe it doesn�t matter that, as in a �human� conversation, one says one thing and the other says something very slightly different? But I�m pretty sure that the first objective of most musicians in such music is to ensure absolute consistency of any recurring musical detail. Listen to the Iona Brown recording on Chandos - my benchmark in this oft-recorded piece - and ask yourself which works more persuasively! Don�t get me wrong: there�s much to admire here. My criticisms, if such they be, should be judged by the highest of standards and expectations. These are enjoyable but flawed - intermittently flawed - performances. And they�re recorded in a warm but detailed acoustic. For similarly �traditional� performances, try Dumay on DG - but the 3rd, 4th and 5th Concertos only. Or, at knock-down price, the Pamela Frank set on Arte Nova, with Zinman�s colourful and energetic accompaniments. Alternatively, among lots of cheap re-issues, there�s Standage and Hogwood on Oiseau-Lyre - a rather strident �ancient music� edge to his sound, admittedly, but beautifully polished and amiable performances. And there�s always Grumiaux, that most musical of all violinists, on Philips Duo. I�m afraid all this �competition� is a notch or two ahead of Mintz. And I say that, despite being a life-long admirer of his playing. The notes are excellent. Indeed, they are exemplary - musicologically and technically informative, admirably detailed but thoroughly readable: and it�s easy to dip in to find what you�re looking for. Full marks for this at least!